This was our first, and possibly only, couch surfing experience and it was marvellous. We were slightly uncomfortable with the idea of couchsurfing because, unlike helpx, you don’t contribute anything in exchange for your room and board, but our hosts made us feel like part of the family. We stayed with a family of four. 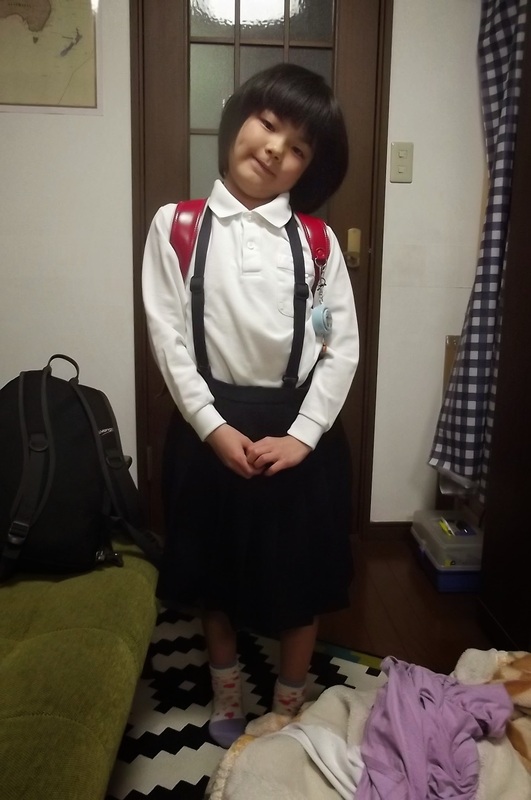 Fumiki, the dad, wants to make his two daughters (Hana, 10 today; and Fu, 7) aware of the world beyond Japan. As it’s not feasible for them to spend time abroad at the moment he’s keen to bring some foreign experience to them in their own home. 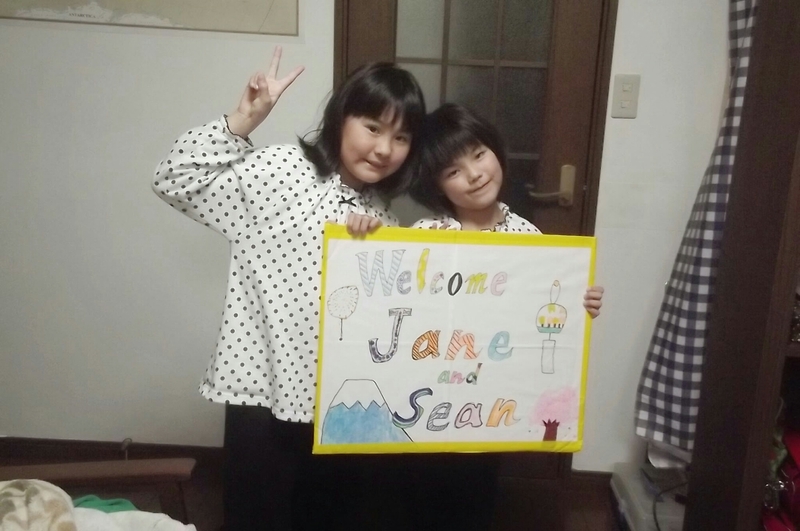 The whole family (including mum, Yumiko) met us off our plane in Osaka with a beautiful ‘welcome’ poster and took us back to their home in Sakai. That evening Yumiko prepared home made okonomiyaki, a kind of omelette/pancake with a filling of meat and vegetables, in the Osaka style. 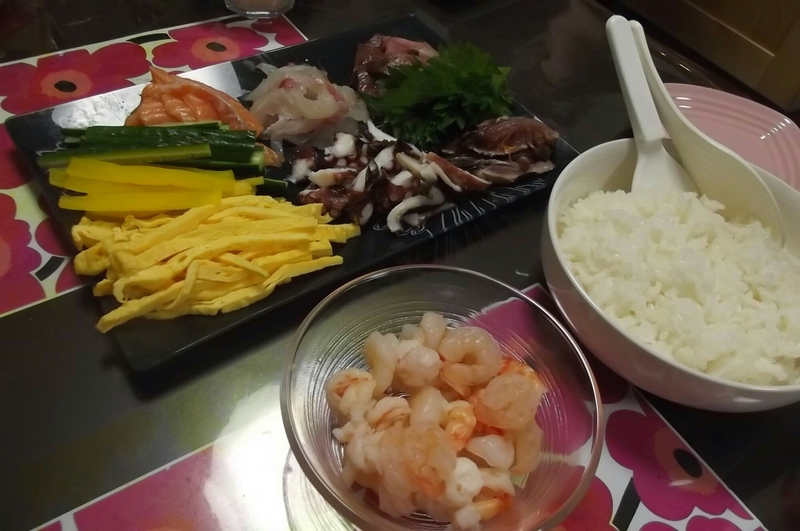 It was delicious and conversation flowed freely with Fumiki translating for Yumiko and the girls, who were delightful, engaging us with their toys and attempts at English. 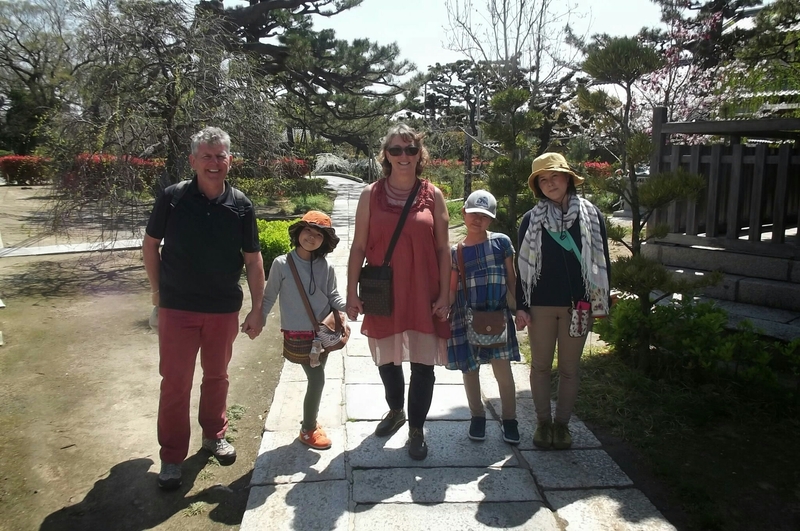 The next day we were taken to a temple which had been home to a famous master of tea ceremony, and a museum of local crafts, including the renowned Sakai knives. That evening, as an attempt to make our contribution, we made spaghetti for the family. Yesterday Sean took the shinkansen to see the Peace Park in Hiroshima while I had a look round Osaka and in the evening we were treated to ‘roll your own’ sushi. We sat round the table with all the ingredients and made up our own combinations. Wonderful! 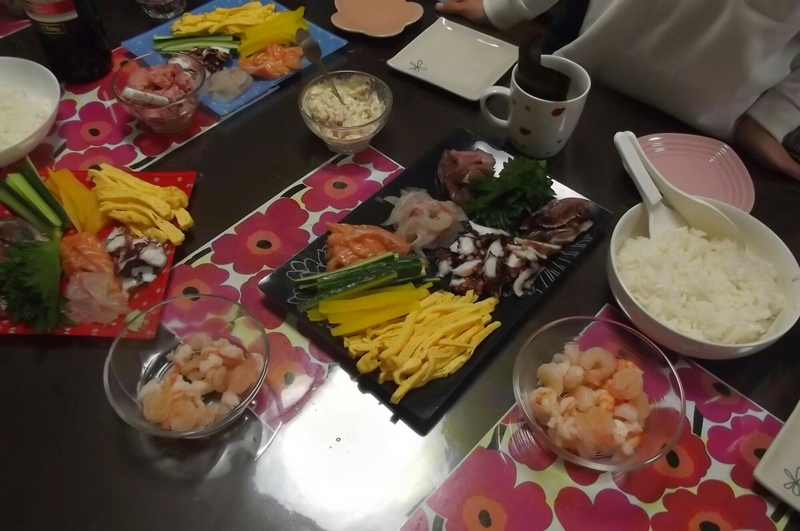 The experience of staying with a Japanese family felt like a real privilege. 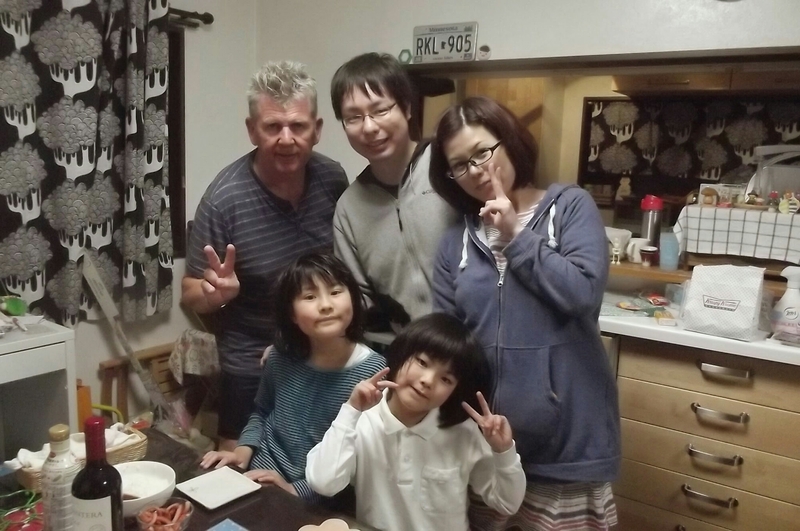 We were able to experience how they live in their home (we slept on futons in their tatami guest room and took part in the nightly bath routine) and see the family dynamics which, like a happy family anywhere included joking, teasing, encouraging and negotiating but without the raised voices. Fumiki is a remarkable man. He used to be a music teacher and still performs when he can but he qualified as a nurse a couple of years ago and is now dedicated to his new profession. He is very clear in his own mind what he wants from life for himself and his family and I’m sure he’ll achieve it. Despite the language gap (Fumiki patiently translating for all) we found we had lots in common and were all interested to hear about the differences in our cultures. We have lots more to talk about so I’m sure we’ll meet again in future. We also be sure to meet you again. Have a good trip and be careful.